We have many great cats available now! Pictures and info updated regularly! Visit our site frequently to see newcomers. at 864-882-4488. * Thanks for supporting ARF! * Please note: this phone number is answered as "FoxNest Veterinary." If you have questions about A.R.F. animals, FoxNest staff will be glad to assist you. AnimalPetDoctor.com ... useful information about the care and treatment of sick and injured pets. You'd never know it from her expression, but this is Joy ... she is a lovely dilute calico. If you move slowly and give Joy a chance to adjust, she begins to purr and purr ... and that's well worth your effort! Joy’s adoption fee of $75 includes lab work, current vaccinations, and a microchip. Joy is already spayed and ready to go home! 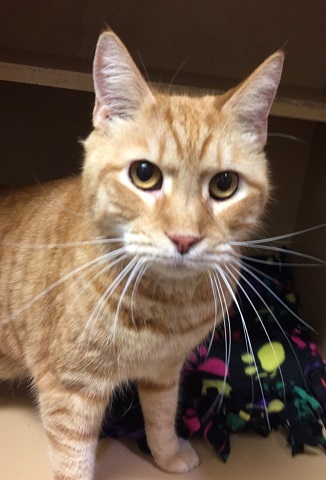 Morris is a very handsome senior neutered male orange tabby. He was surrendered to ARF, and came from a multiple cat family where he had trouble dealing with so many other cats in the household. We strongly recommend that if there are other cats already in the household, a "meet and greet" is arranged to avoid any potential conflict. Otherwise, Morris is a bit shy, but warms up quickly when petted, and truly is affectionate when he's thoroughly acquainted with you. Morris’ adoption fee of $75 includes current vaccination and a microchip. Morris is already neutered. Caleb is as handsome as can be, and has a slightly feisty - but fun - manner. He loves playing with toys, dodges in and out of ARF's play tunnels, and hops on and off the various cat towers in our kitty room. If you want a cat with a bit of sass, then Caleb is perfect for you! Caleb's adoption fee of $75 includes lab work, current vaccination and a microchip. 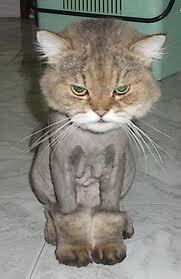 Caleb is already neutered. 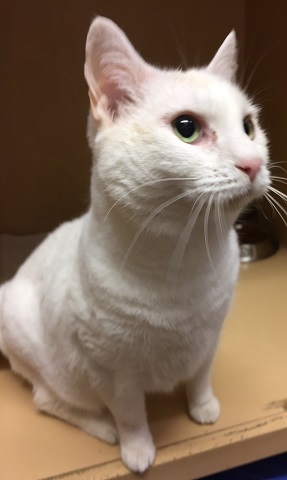 This lovely girl is Snowball, a spayed female with gorgeous golden eyes. Snowball has made great progress adjusting to life in the shelter, but she truly longs to be in a home of her own. Somewhat vocal when unsettled (like moving her to a new space), she adjusts quickly. She enjoys being brushed and petted ... so much, in fact, that when you stop, she'll lightly nip at your hand or wrist, as if she's saying, "More, please!" 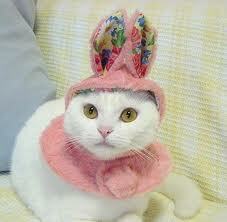 Snowball would prefer a quiet home without children or other pets. Snowball’s adoption fee is $75, which includes current vaccination and a microchip. What can we say about Hazey? He’s the perfect mix of playfulness, curiosity, and friendliness! He likes other cats, is fine with children, and has no interest in dogs. 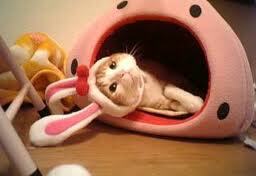 And talk about cute! This male silver tabby, born October 1, 2018, is too good to be true! Hazey’s adoption fee of $75 includes lab work, vaccination, his neuter procedure, and a microchip. This soulful-eyed fellow is Danny. Oh, Danny boy - you'll be adopted soon, we have no doubt. Already neutered, this boy is very friendly and will make himself your best bud! Danny's adoption fee of $75 includes lab work, current vaccination, and a microchip. You can almost imagine K.C. is thinking to herself, "Have you come to take me home?" K.C., a spayed female calico, is almost ten years old and arrived at ARF when her person died. Not surprisingly, K.C. is confused about her new surroundings, and when adopted, she will need time and patience to make another adjustment. This quietly chatty girl responds well to gentle voices and a few treats, rewarding you with a steady purr. K.C. would be happiest in a quiet home without other pets or children. Her adoption fee of $75 includes lab work, current vaccine and a microchip. 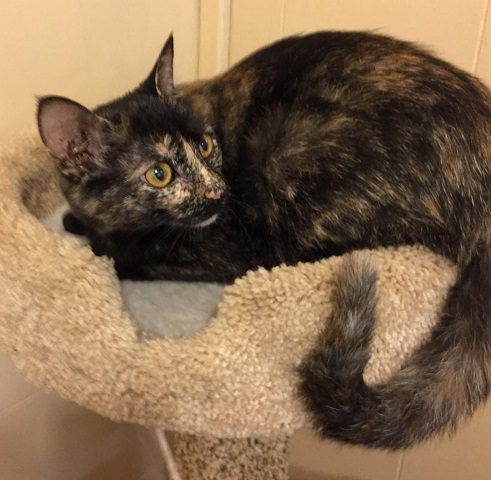 London is a stunning female torti who LOVES to play with her sister, Mini. While getting her photo taken, she kept jumping down and zooming around the room, pouncing and then hiding. Though not a requirement, these two are so much fun together ... why not consider adopting both? London’s adoption fee of $75 includes lab work, current vaccination, her spay procedure, and a microchip. This is Mini, London's sister. She's easy to identify by the distinct blaze of orange on her nose ... and by the delightful chirping noises she makes as she zooms around while playing with her sister. Though not a requirement, these two have so much fun entertaining each other, it seems a great idea to adopt both! 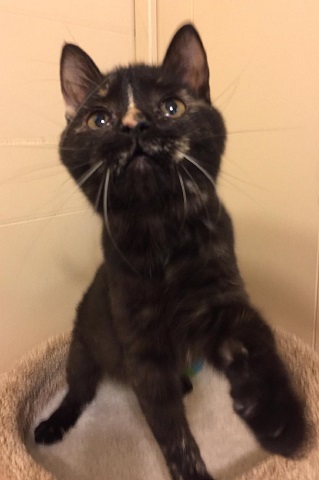 Mini will be spayed prior to her adoption. Mini’s adoption fee is $75, which includes lab work, current vaccination, her spay procedure, and a microchip. Sandy is a handsome, neutered male orange tabby, Staff say he is very friendly and outgoing, and use the word "wiggly" to describe him. In other words, he sure would love to get out of his cage and romp around a bit and then settle in for a good snuggle on your lap. Sandy's adoption fee of $75 includes lab work, current vaccination, and a microchip.